BFR - Blast Freezing Room - is the result of long-term research and development of the "Ostrov" company. The innovative air distribution system used in BFR allows us to minimize losses in the air path and to organize effective heat exchange on the surface of the cooled products. 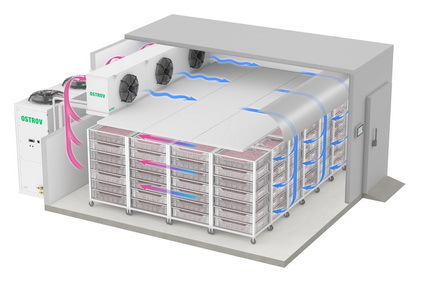 Thus enabling high efficiency of the cooling of products with a simultaneous reduction of energy consumption. This makes BFR one of the most energy-efficient products on the market at present. Optimized for use in a wide range of temperatures, the cooling system is designed to use both traditional and modern ozone-friendly refrigerants with low global warming potential (GWP). BFR fully complies with the legislation of both the European and Eurasian Economic Unions, and the optimal ratio of all elements of the facility reduces refueling to a minimum. It is worth noting that "Ostrov" offers a complete delivery. This makes it possible to quickly and efficiently perform the installation and commissioning of BFR.